Write quickly! No keyboard needed!! 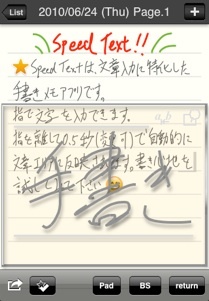 SpeedText is a memo application for handwriting input. You can write words or numbers on a screen input pad. The content is automatically displayed on a text pad 0.5 seconds after releasing your finger from the screen. You can write smoothly, no need to scroll the window. - Write text using your finger. - Immediately shows the text after you write. - Insert new line using the "Enter" button. - Delete text using "BackSpace[BS]" button. - Move the cursor location by touching on word. - Add or delete pages. Move page using arrow buttons. - Device rotation is supported (select from Auto, Portrait Fix, Landscape Fix). - Selectable input wait (minimum: 0.2second, maximum: 0.8second). - Selectable the input pad height (High, Middle, Low). - Selectable word space (minimum: 0px, maximum: 24px). - List View is availavle. - Continuing write button which box up wordspace is available. - Lock timer button and continuing write button are selectable (Yes,No). - Icon insert and icon serach. Jul 01,2009: Version 1.1 is now available ! Aug 13:Version 1.2 is now available ! Aug 26:Version 1.3 is now available ! Sep 13:Version 1.4 is now available ! Sep 27:Version 1.5 is now available ! Oct 13:Version 1.5.1 is now available ! Nov 21:Version 1.6 is now available ! Dec 22:Version 1.7 is now available ! Jan 12:Version 1.8 is now available ! Jan 22:Version 1.8.1 is now available ! Jun 8,2010: Version 1.9 is now available! Jun 24,2010: Version 2.0 is now available! Jul 2,2010: Version 2.0.1 is now available! Aug 17,2010: Version 2.1 is now available! Aug 30,2010: Version 2.1.1 is now available! Sep 16,2010: Version 2.1.2 is now available!